Okay, flay me alive and call me a suitcase! I actually came home from Istanbul on SUNDAY, which is several days ago. And I am so sorry for not telling you "all about it" and posting pictures, or anything at all. Accept my humble apologies! But yes. I wont bore you more. Here are all the juicy, not so juicy and all the dry details! I travelled with my dad, my stepmum and Helge last Thursday like at the crack of dawn. The trip was originally a gift from my dad for my 18th birthday, which is three years ago. And now we had finally found the time to go! We had a flight connection through Riga, Latvia and landed at the Ataturk airport in Istanbul where we sat and watched our own perspiration for half an hour because the driver was stuck in traffic. They really do drive like mad men those Turks! I tell you that much. But somehow he got us to our small hotel close to Sultanahmed on the Golden Horn (which we may consider the "old" part of town, even though most of the city is so old anyway that it really doesn't make that much sense). The staff at our hotel were so strange. During a power cut one night we approached the hotel doors and the receptionist pretended to give us a sci-fi face scan in the dark with sound effects and all to see if we would be allowed to enter. It was hilarious! And the waiters at the rooftop restaurants were so animated and gesticulated so wildly that we were entertained every minute we sat there. It would appear the Turks have a really inclusive sense of humour. All over Istanbul there were old Hamam's (Turkish baths), mosques, remnants of Byzantine city walls, fantastic wooden palaces and parks, pavilions, side walks the size of dachshunds, and stalls selling assorted Turkish fast food. Of which I loved the most the Simit (the skinny bagel-shaped breads covered in toasted sesame seeds), Lokma Tatlisi (sweet, deep fried doughnuts smothered in syrup, cinnamon and ground pistachio), and the Balik Ekmek (fresh grilled fish sandwiches with onion). They also had stalls all over selling grilled or boiled sweetcorn, roasted chestnuts and their famous "stretchy" icecream, Dondurma. Of which the latter the Turkish eat a staggering 2,8 litres each a year! This strange icecream is made of a product derived from orchids called "salep" and also arabic gum ("mastic" - not the same as gum arabic! ), which is why it is so stretchy. I thought it was quite nice, but as with all other Turkish desserts it is intensely sweet. I wonder what they think of our desserts. Anyway, we visited the Topkapi palace which was the home of the Ottoman sultans for 400 years. It was extremely big, and we got to hear of the grand viziers and the concubines - which was exotic to say the least. By the way the audio tour is a grand ripoff and it basically just reads you what it says on the plaques positioned around the palace. Actually - it doesn't even do that. It said less. Anyway. We didn't get to see the treasury because of all the crazy tourist people that had formed a line the length of the great wall of China. We did however get to see the relics - including a golden cast of the hand of John the Baptist, the turban of Joseph, the sword, a cloak and some of the Prophet Mohammed's beard(!). Oh, and of course the staff of Moses - which if I may add - looked very springy despite being about 3500 years old. Detail from one of the harem windows. The view from the palace was grand, the harem was the most interesting bit, we saw the guards gigantic mirrors that allowed them to keep watch around corners - the hamam (Turkish bath) of the concubines, the sultan's mother's quarters and even the sultan's toilet! We also visited the large swimming pool "where the dwarves did tricks" according to the audio guide. The dwarves were not mentioned before nor after this statement was made during the tour. But apparently it was probably good entertainment when you were sick of toying with your 300 concubines. 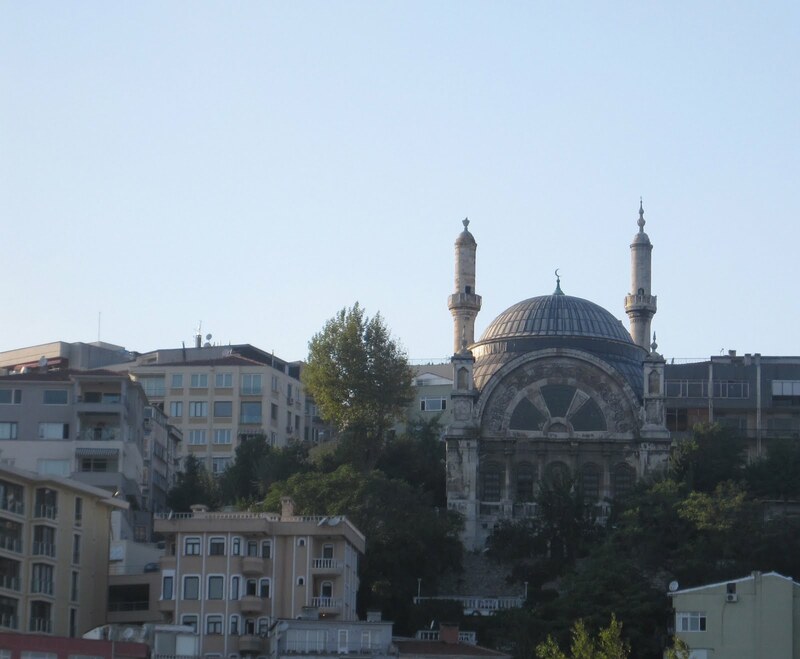 We also saw the Blue Mosque which wasn't really as impressive as I'd expected. First of all it wasn't nearly blue enough, and though the grand dome and the intricate iznik tiles were very splendid indeed - the spectacular mosque seemed somewhat smaller on the inside because of the low wrought iron chandeliers that hung low above the floor. But now I've been there and at least that's one more thing checked off my list! We did spend hours traversing the Grand Bazaar which is one of the largest indoor markets in the world. They mostly sold a lot of junk to be honest, we did buy Turkish tea, teacups and a gunmetal hookah that is quite awesome if I may say so myself. I also got a longer gold chain for my opal necklace. The carpets and the jewellery was simply amazing and among the things that are definitely worth purchasing when in Turkey. I would've bought tons more myself, I am just not cut out for haggling it appears. And being a naive Norwegian I absolutely hated to make purchases. They were always trying to rip you off, quite nastily. And because everything is so sickeningly expensive where I come from - then how could I possibly tell? Luckily my stepmum is a badass haggler and dad drove a carpetseller to the edge of madness. He wanted to sell his 250€ carpet for 50€ because he got so desperate when dad didn't want it. Giggle. So the haggle culture was what I disliked the most, definitely - that and that it felt as if I couldn't trust anyone, they would take my tourist money without blinking if the situation allowed it. Constantine's Pillar was really nice, and positioned quite near one of the Grand Bazaar entrances. Constantine himself had it brought over at around year 330 to mark the transfer of the seat of the Roman empire from Rome to Istanbul (Constantinople). He also supposedly buried some relics beneath the fantastical porphyry pillar, like the axe Noah used to build the Ark. Yay! We went on a boat trip up the Bosporus (the strait separating east from west) and saw all the fantastic luxury hotels and houses, the old fortress, a graveyard and countless amazing mosques and wooden palaces.I will definitely recommend such a trip to anyone who wants to see as much of Istanbul as they can if they don't have a lot of time on their hands. But there you go. We saved the Hagia Sofia (Aya Sofia) for last. Thank goodness, or nothing else would've seemed impressive. The huge structure is a 1500 year old church that served as a mosque during the 1500s and is now a museum. Kind of both, but neither. Underneath painted plaster are amazing, ancient mosaics of Christ and standard motives - while the world's biggest calligraphy plaques are hung in four corners of the dome. The stained glass are with calligraphic motives, there is a mihrab, minbar and outside is an Islamic washing font. A religious fusion cocktail. At the southern entrance there are Byzantine bronze doors that were added around year 800, really beautiful. The dome of the Hagia Sophia, if you enlarge it you can see the masked and unmasked angels - the faces were discovered earlier this year! The dome which is almost 60 metres above the floor took my breath away. It was created by some Greek architects that also decided that the centre of the earth was within the church, slightly to the right in the main hall. It was seriously huge. From the outside it looked like a city all in itself, and it still holds many uncovered secrets as a lot of the original mosaics are still plastered up. It was built with a lot of stolen goods from plundered pagan temples such as some incredible Hellenistic porphyry columns. You see the Byzantine were incredible at recycling. It was the most amazing thing we visited that didn't include food on this trip! We ate insane amounts of kebab and köfte (Turkish meatballs) and drank litres of Turkish apple tea whenever possible. We journeyed home, had some depressing "Soviet-pizza" at the airport in Riga (although it tasted nice!) and when we came home our house wasn't on fire. That's nice. So yes. I don't think I could've made that any more informative and dry. Sorry. But it's all true what happened. And I am thoroughly fascinated, so forgive me. I am guessing it is TLDR anyway. Thanks for a fantastic trip everyone! Agreed! Tricking tricksy trickpeople. Nasty habit. Me no like! Thank you Tink and Aya!